Reeling from what the students at Excelsine University are calling "Bloody Tuesday," Ren is determined to regather her magical family. But the events of the attack were not without multiple costs. 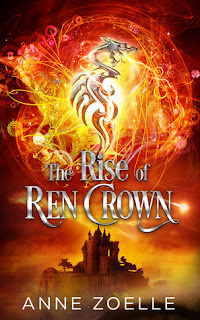 Magically broken and exposed, Ren is ripe pickings for multiple factions that want to use and chain her, and the Department is the scariest of the pack. I thought that this was the final book in the series, and was surprised to learn it is not. Ren’s character continues to grow. She continues to be the best friend that she can be. She still puts herself on the back burner for her friends. The bond between all of them is strong. In this book we see more of the contrast between Dare and Constantine. Ren’s magic makes her a target which in turn puts her friends in danger. The loyalty and disloyalty in this book has been taken up a notch. Fighting the “Department” was terrifying to read. This book in my opinion is much darker and more violent. Don’t get me wrong, I love dark novels. This one seemed to end so abruptly that I can’t wait to read what will be in the next one. I will warn that this one is a lot more violent. I enjoyed it immensely.